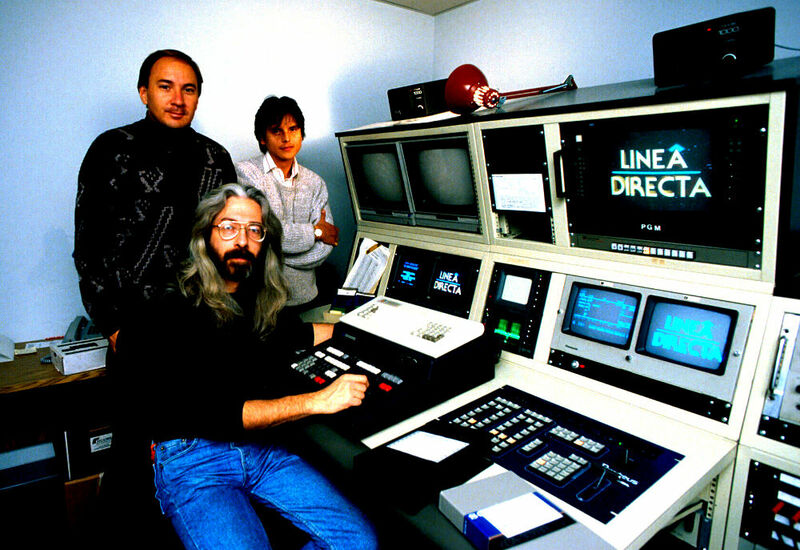 Producer, Eduardo López, host, editor, Antonio Leiva, and host, Arturo Salcedo, the team responsible for the Spanish-language public service television series, Línea Directa (1992). The tiny production company’s first effort, if you can picture it, was recorded in someone’s bathroom. Without access to a real studio, the unusual locale made acoustical sense, and to this day Arturo Salcedo can see himself crouching, speaking into a corner, while Eduardo Lopez played sound man. The result was a Spanish-language public service announcement on fire prevention, produced in 1986 by the D.C. mayor’s Office on Latino Affairs. Few knew that the man shown sleeping on a bed was Salcedo’s father, a stand-in, or that the sound taping would have been much easier if the upstairs tenant had not flushed every few minutes. The direct heir to that amateur production is “Linea Directa,” an award-winning public service program that begins its third season tonight with a show on domestic violence (10:30 p.m. on Channel 48). Expanded from one show a month to two, “Linea Directa” (Direct Line) is the only regional Spanish-language television show of its kind and a singular forum for the growing local Latino community. The show is an unusual hybrid, even in the highly flexible world of government-sponsored public service television. It is produced by the District, recorded free of charge at the independent D.C. Cablevision studios and aired on both Channel 16, the city cable channel, and Channel 48, the regular commercial Spanish-language station. Maryland and Virginia have provided funding for shows, as have labor unions and Amnesty International. This “partnership,” as Lopez called it, has allowed “Linea Directa” to overcome the parochial reach of most government public service programs. A study for Channel 48 found that 50,000 Latino households tuned in to “Linea Directa” — a figure that could represent a quarter of all Latino residents in the area. The shows generally focus on issues affecting Latinos and then offer information and advice — crucial for a community where, Lopez and Salcedo say, large numbers of people are still ill-informed about a broad range of available services. Many Latinos are unaware that school systems rely heavily on parental involvement, and the show is credited with trying to break down that cultural barrier with a program on education. That program was aired last season and proved so popular that another segment is planned. “Linea Directa” relies on community-based organizations and local experts — doctors, lawyers, educators and social workers — and the show regularly presents Latino professionals who normally would not get such exposure in the mainstream media. Tonight’s episode on domestic violence includes interviews with three Latino women who explain how they escaped abusive relationships. Specialists include Laura Martinez, a lawyer at the District legal clinic Ayuda Inc.; Ramon Colon, a District police officer; and Sylvia Diaz, a counselor at the Family Place, a District-based social service agency that serves Latinos in the area. Lopez and Salcedo have broadened their format to include on-site shooting, docudramas and dramatizations, all used in tonight’s show. That formula was tested last season and already has paid off. Three programs recently won awards from the National Association of Telecommunications Officers and Advisors, and “Linea Directa” was the only foreign-language program cited by the 400-member trade group. One of the shows is a docudrama about a Salvadoran immigrant’s first year in the region. Written by Salcedo, a Colombian who is the show’s moderator, “Los Ruegos de Andres” (The Prayers of Andres) will debut in the mainstream media Oct. 7, when WETA, Channel 26, airs it as part of its Hispanic Heritage Month programming. For Salcedo and Lopez, the director and a Salvadoran, the awards vindicated a struggle that began when $13,000 in corporate donations allowed them to buy a used camera in 1987. Now the Office on Latino Affairs is co-owner, with D.C. Cablevision, of an editing studio. The two are self-taught technicians, and the windowless room in the cable station’s Northwest Washington offices is a second home during production. The show has made Salcedo a star of sorts. He has been approached by people on the street and asked to solve their problems. Once, the kitchen staff of a downtown restaurant came out one by one when word spread that he was there. Another time, Lopez noticed a family sitting in McDonald’s, pointing to Salcedo and whispering.